Hello, and welcome to Cleveland! I’m Douglas Clay, a longtime Cleveland resident and evaluator with Candor Consulting. I focus on data analysis and assessment training mostly with K-12 schools. I’ve been in Cleveland long enough to remember when the Browns were a winning team, when the shopping centers were steel mills, and trendy Tremont was the plain old Southside. As the city is on an upswing, enjoy your stay and check out some of the revitalized sections of my town during the conference. After you return to work you might like to investigate the following resource I discovered years ago while working with the Cleveland Public Schools. I was tasked with preparing student testing results for school administrators and teacher leaders for a weekend planning retreat. I was called down to the superintendent’s office on a Tuesday afternoon and given a box of state testing reports. I was responsible for turning these stacks of little numbers into usable information for educators in three days. What I learned that afternoon was that nothing focuses the mind like terror. Luckily, I was able to draw upon the genius of Edward Tufte and his classic book, The Visual Display of Quantitative Information. Tufte outlines the theory and practice of designing data graphics. The book gives detailed analysis in how to display data with precision, accuracy, high data-ink ratio, and aesthetics. There are over 250 illustrations showing right (and wrong) ways to display lots of numbers in a small space for maximum understanding. His theories of graphical excellence are extended in subsequent books on the subject, all worth your time if you have a need to make sense of complex data sets and engage stakeholders in meaningful discussions. The quickest way to jump into graphical excellence is Tufte’s one day course. He tours the country presenting to groups of academics, journalists, financial analysts, and policymakers. The course includes all his books and is well worth your time. As I explained to a colleague who questioned my investment of time into creating graphs for schools by asking, “What, do you have to draw them a picture?” I responded, “Yes, yes, I do.” Tufte shows how to make that picture the most effective one for each type of data. The following graphics are from work I’ve done recently and I hope they illustrate Tufte’s principles. The first displays 256 separate data points to show test scores over time. It allows a school to see the overall direction as well as how their progress deviates from the average. 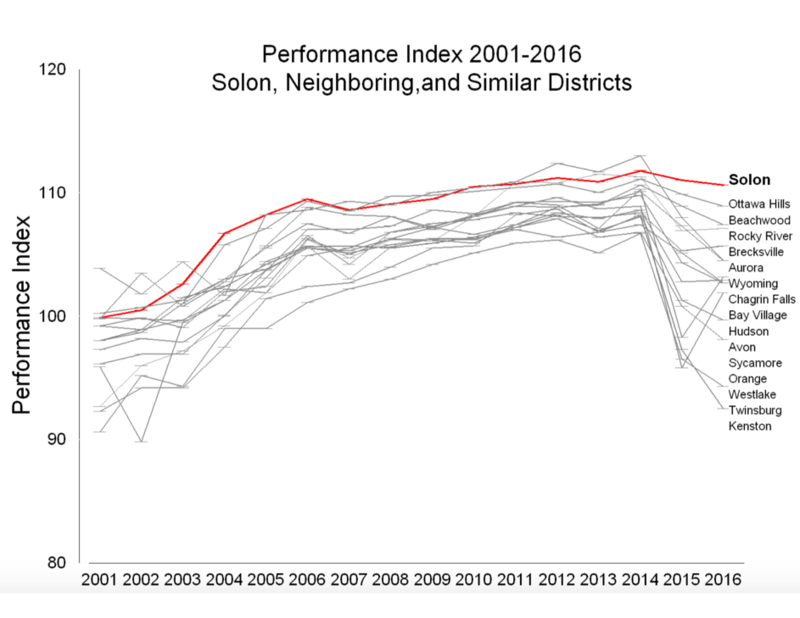 What they viewed as plateauing over two years after years of increasing scores is contrasted with neighboring, similar, schools falling off a cliff. This graphic displays a high school’s recent graduates’ college enrollment. The National Clearinghouse dataset follows college graduates for years as they enroll and complete college degrees. It allows for measurement of persistence and transfers between schools. Tufte will teach you why this graph is more effective as a donut rather than a pie chart, and also allows decision makers to “see” the data without poring over charts of numbers. Thanks Doug I really enjoyed this post. Your performance index chart is great – taking inspiration from that for my own work. As a newly returning Clevelander, I’m thrilled to see the flourishing cohort of Cleveland-based evaluation professionals.